A fabulous mile-high buttery cake filled with luscious strawberry creame, this will certainly be one of your favorite cake recipes! Whether you are celebrating a special birthday or just having a family gathering, this strawberry cake will be enjoyed by all. To make the cake, preheat oven to 350° F.
Lightly coat the cake pans with non stick cooking spray. Sift the cake flour, sugar, baking powder and salt into a large mixing bowl. Add softened chunks of butter and mix on low for 20-30 seconds. The mixture should be lumpy. Add the milk and vanilla extract. Mix on medium speed to thoroughly blend the ingredients. Scrape down the sides of the bowl and add in the eggs ones at a time making sure to combine well before adding each egg. Bake until the cakes are golden brown and a toothpick inserted into the center comes out clean, approximately 30-35 minutes. Set the pans on a cooling rack and allow them to completely cool. Run a knife around the edge of each and invert the cakes onto the racks. With a serrated knife, cut each round cake in half horizontally through the center so that you end up with four rounds. To make the whipped cream center, pour the whipping cream into a medium mixing bowl. Whip on medium speed for two minutes then go up to high until the cream thickens. Puree the fruit in a food processor along with two tablespoons of sugar and the lemon zest. Gently fold the fruit puree into the whipped cream. Place one of the bottom cakes onto a cake platter. 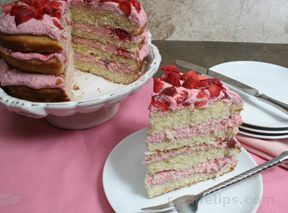 Place the second layer on top of that and continue layers of cake, whipped cream and strawberry slices until all four layers are finished.